What I love about Korean food is that it always comes with so many different side dishes. 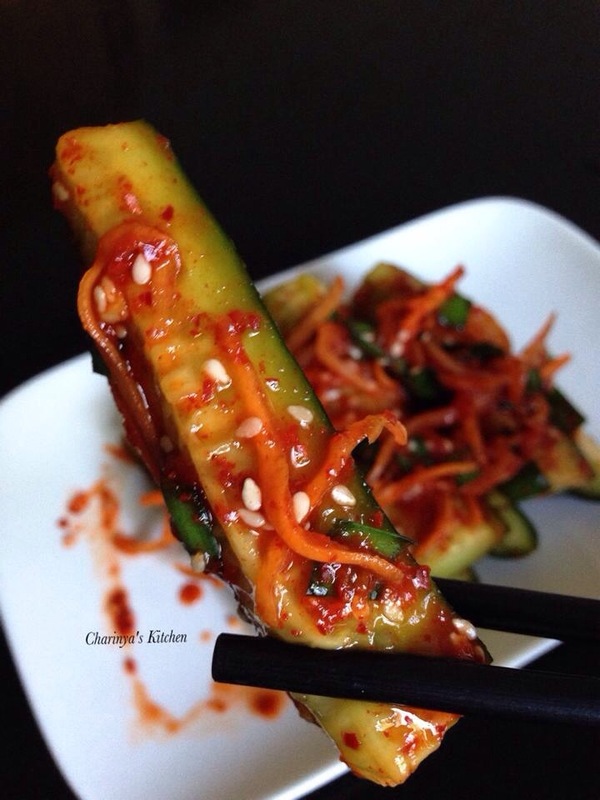 One of my favourites is “Spicy stuffed cucumber kimchi”. 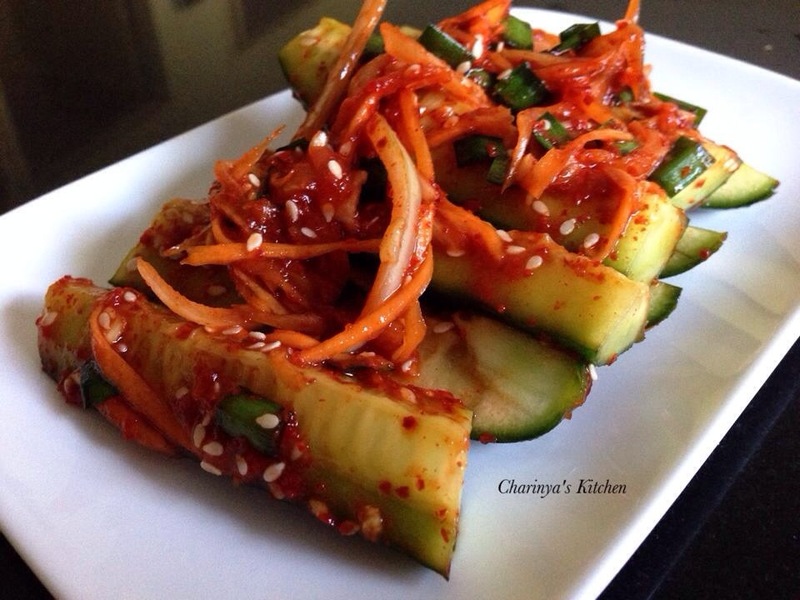 After searching for a recipe I found a website that has so many Korean recipes. 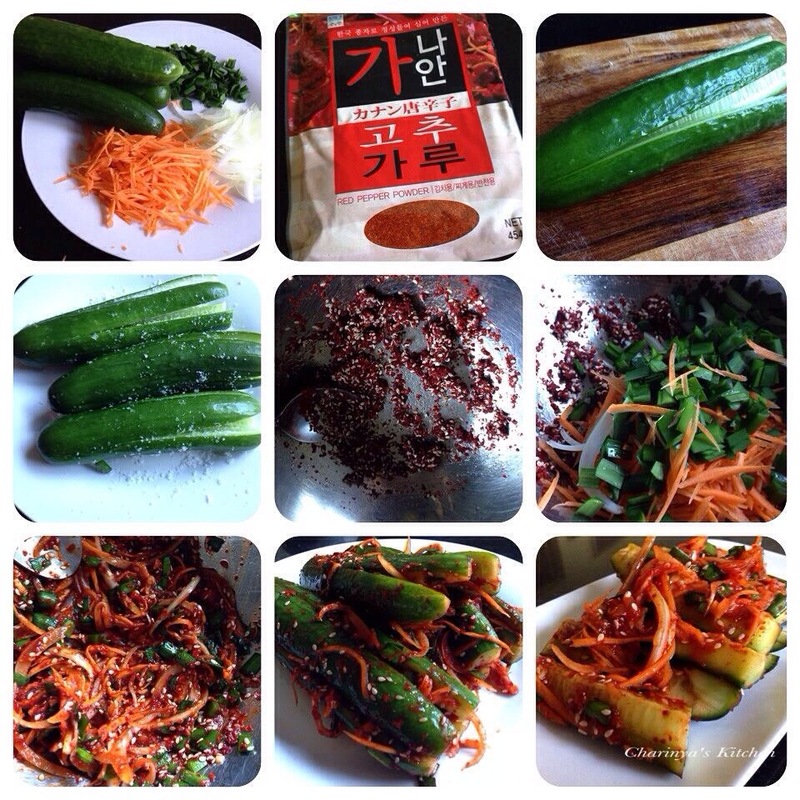 The website is “Maangchi”, and I thank them so much for sharing their recipes. My version is just a little bit different from the original one as I have adapted it to suit my tastes. 1. Wash the cucumbers. Make pockets out of them by slicing them twice lengthwise at right angles,1/2 inch from one end so the cucumber quarters are still connected to each other at the end. 2. In a big bowl, rub salt with cucumbers and leave for 10 mins. 3. In another bowl mix fish sauce, sugar, water, Korean chilli powder, garlic and sesame seed then add carrot, onion and garlic chive. This is a seasoning stuff paste. 4. Wash the cucumbers to get rid of the salt and pat dry. 5. Stuff the seasoning paste into the cucumber pockets. 6. Serve immediately as a side dish for rice, and keep the leftovers in the refrigerator. If you prefer it to be fermented a bit more, let the container sit at room temperature for a couple of days until it smells and tastes sour. Then put it into the fridge. Serve cold. Next ›Fried king mackerel with green mango (Apple) salad.